I’ve been trying to work a walk around the block into my morning ritual. It’s nice. Ideas come. Temperature is good. 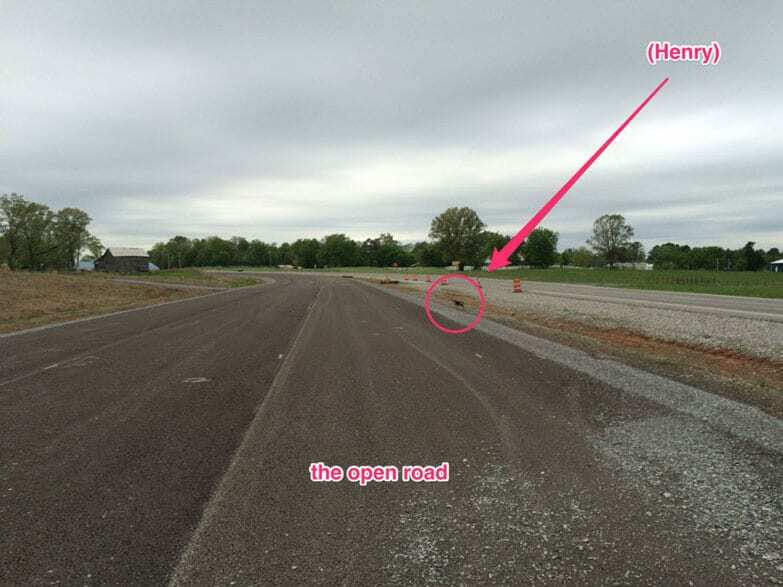 And especially now, I get to walk in the middle of the road—the bypass near my home is still a work in progress. Is that legal? not really sure. … where was I? So this morning, a buddy joined me: Henry. Henry is a beagle. He belongs to someone in my neighborhood. He’s energetic. He’s cute. And this morning, he played sidekick as he marked a stop sign and rolled his head into a dried up dead bird laying on the ground. As I got out on the bypass, Henry was still following me. Not good. This pic is the unfinished bypass and Henry is that dog-shaped dot. But Henry’s not my dog. If my assumptions are correct, what are those speeding drivers lacking? It’s the same in your business… in our businesses. … it’s the same thing people lack when they look right over your Facebook post you that was so creative. Those drivers didn’t have any context: that I preferred Henry to return home safely and avoid the risky bypass—not join me on the highway. There’s an expectation among a lot of entrepreneurs, that passers-by are going to appreciate what it is they do and how helpful they are. It’s unfair to your people because, unless they’re smack-in-the-middle of the problem that you help them solve—and in the room with you—they’re out of context. People with no context don’t care what you do, no matter how much you help to make their lives better. It’s like my soup/crackers analogy in my last email: They’re not eating soup right now. So are we going to solve this in a single sentence? No. First, get in ‘mental context’ yourself: Think of your last transaction. Got it? What problem were they facing that made them reach out to you? How long were they dealing with that problem before they finally did something about it? An hour? A week? A year or more? Then what was going on in their world just before your client/customer got to you? Now, what were they thinking? If they hadn’t made that transaction with you, what would they have done instead? Could they have just gone without solving that problem? … for how long? … what would they eventually face as a result of leaving things the way they were? Wanna see businesses that aren’t thinking about any sort of context? Browse the internet (look at ads). Pick up a magazine. Check your junk mail. Shoot! Go to your competitor’s site or Facebook page. Are they saying anything even remotely relevant to your prospects’ behaviors (context)? … or are they just shouting a bunch of “me too” same ol’ same ol’? Nail it down. It changes everything. Awe. yes you do! If you didn’t, you wouldn’t be in business at all. Let’s help you nail down some context. Props goes out to my wife who is a great cook. I wouldn’t be enjoying leftover soup and been inspired to write this if it wasn’t for her.